This entry was posted in Training & education on 2015/10/28 by Susan. Vacuuming, cleaning bathrooms, and making beds are just a few of room attendants’ tasks. More than half of all injuries in the accommodation industry involve this group of workers, and that’s why industry and WorkSafeBC created some new safety resources for them. This new video series for room attendants shows safe work procedures and instructions for preventing injuries while making beds, cleaning bathrooms, wringing cloths, dusting high surfaces, emptying trash cans, and vacuuming. The hard-working people in the videos are not actors but are real room attendants with nearly 30 years experience – so they have done the procedures many, many times. Employers can show these videos – available in English and Tagalog – then follow up with the new Discussion Guide to reinforce the message from the videos. A new poster series is also available for download. “Employers can hang the posters in room attendants’ lunch room as a visual reminder of correct posture and movement,” says Lorne, who is a member of the technical advisory committee for this group of workers, along with go2hr (the BC tourism and hospitality industry’s human resource association), the BC Hotel Association, and the BC Lodging and Campgrounds Association – all of whom are distributing these resources to their members. 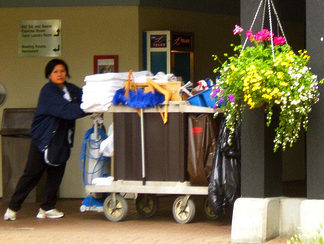 WorkSafeBC reports the most common causes of injury to accommodations workers, as a whole, are overexertion, falls on the same level, and being struck by objects. Thanks to Lorne for telling me more about these new resources.